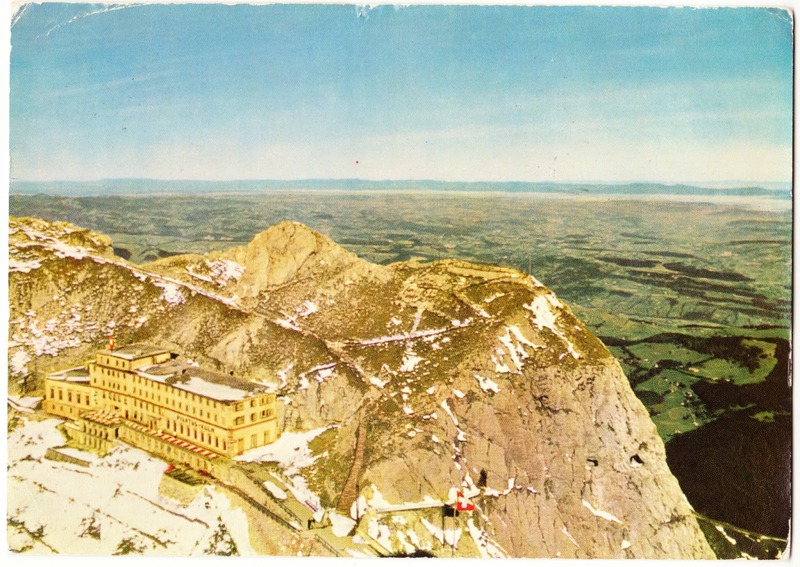 Sixty years ago, in 1958, my great-grandmother, Greta Miriam Chandler Adams, mailed this postcard of Hotel Pilatus-Kulm to my mother (Mary Margaret) and my uncle (Charles), who were then living in the house on Oak Crest Lane in Wallingford, Pennsylvania. The historic Hotel Pilatus-Kulm was built in 1890 and rests nearly 7,000 feet about sea level, atop Mount Pilatus, overlooking Lucerne, Switzerland, and the smaller town/suburb of Kriens that sits at the foot of the mountain.1 While the 360-degree views during the daytime are understandably spectacular, guests also rave about the night sky and the astronomy excursions. Lisa Michelle Burns of The Wandering Lens writes: "During the evening however if you're lucky enough to be spending the night, it's just you, the mountain air, the odd mountain goat and the stars." Check out her full post and spectacular photos. Just took a ride in aerial-car to this mt. & back by rail-way. More fun! Beautiful view! I love Luzern, hotel on Lake & a beautiful. You ought to buy that $8.00 folding camera, good buy! Sorry, I did not, mine broken the click does not open the shutter, so will bring films back. Using new one. Like our hotel on Lake Luzerne & beaut. view & the shops are pretty. I have lovely things. Greta C.A." "One [story] goes that in the summer of 1421, an enormous dragon was flying to Mount Pilatus when it crashed close to a farmer named Stempflin, who fainted from the shock. When he recovered, he found a clot of blood containing a 'dragon stone' and took it to the city, where the stone’s healing powers were 'officially' confirmed, as any ills his family suffered were miraculously cured. It was said to be a nostrum for 'haemorrhage, dysentery, diarrohea, poisoning, plague, and nosebleeds.' ... [There is] another story of a young cooper who went wandering the mountain in the autumn searching for rods with which to make barrel hoops. He fell into a deep cave and landed between two fire-breathing dragons. The dragons nurtured the drop-in through the winter, feeding him moon milk, whatever that is. When spring came, one of the dragons helped the cooper by holding out its tail as a bridge for him to scale so he could exit the dark cave. Then it flew the inadvertent guest on its leathern wings to a lowland meadow and carefully alighted. When the cooper got back to the city, he had the tale of his adventure embroidered on a silken tunicle, which remains today under glass at the Church of St. Leodegar in Lucerne."